Large Hadron Collider Black Hole Fears: End of the World? Large Hadron Collider and the Black Hole: The largest atom smasher ever built, the Hadron Collider, will get turned on Wednesday and some think it could destroy the world. 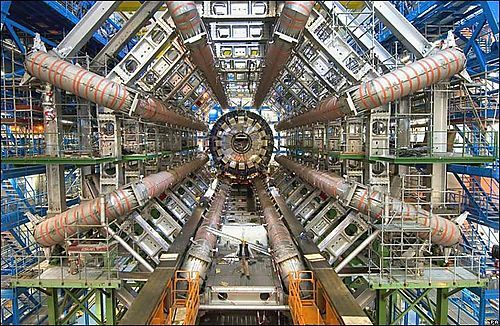 $9 billion has been spent in an effort to find the so-called “God particle”, a subatomic particle that up until now has only existed in theory. The largest scientific experiment ever built, by man at least, is 100 meters below the Swiss countryside and will fire two beams of particles, at nearly the speed of light, towards each other, around a 17 mile circle. The collision of the two beams is expected to produce a burst of subatomic fragments that have never been seen. Scientists are hoping the impact’s results could give them insight into dark matter, which is believed to make up the bulk of space, and possibly prove the existence of the Higgs Boson, the so-called “God particle”. Its detractors fear that mini Black Holes and ruptures in space could be caused as well and threaten the entire planet itself. But rest assured, it won’t happen. The Large Hadron Collider , the greatest atom smasher ever created, the world’s biggest machine, was switched on today at CERN, the European nuclear research centre outside Geneva. And the result: rather less than earth shattering. “Five, four, three, two, one, zero – nothing,” joked Lyn Evans, leader of the LHC project, before a fuzzy dot appeared on a monitor. It was 9.30am local time when a stream of protons was introduced into a short stretch of the circular 17-mile underground racetrack, buried in the Jura Mountains on the Franco-Swiss border. The fuzzy dot registered their arrival, and then – well, not a lot. But to the scientists who have devoted their working lives to the project it was a moment of consummation. Protons streams were then introduced into more and more of the machine until less than an hour later – far earlier than predicted – a stream whizzed around the entire circumference of the particle accelerator at a shade under the speed of light. The LHC had passed its first crucial landmark. The scientists at CERN have dismissed the claim as ill-informed nonsense, and it certainly wasn’t going to happen on today’s inaugural test run, which did not include the sub-atomic collisions needed to produce an Earth-munching singularity. Dr Evans, the coal miner’s son from Aberdare, south Wales, who grew to lead the LHC project, the biggest thing in so-called Big Science, was so moved by the first completed circuit that he could muster only a few words.